Now to begin with, the term UK bass music is a pretty broad one. In our eyes, this can cover an extremely wide range of genres and styles, anything from dubstep to bassline to garage to funky to grime to breaks and everything in between in fact. Now, due to this rapid expanse of an overall umbrella title, it’s safe to say that we are seeing more and more crossovers within the genre boundaries, a very common one now being funky and breaks hybrids or even some pretty dubsteppy grime pieces. We love this expansion and wholeheartedly believe it is the best way for all the individual scenes to grow. However, when it comes to playing out live, a mix and match between multi-genre styles can often lead a crowd into a cloud of confusion, often being thrown off by the unpredictable switch ups rather than taking enjoyment from the unexpected. Because of this, most DJ’s after a short amount of time will find themselves drawing for their secret bag of tracks, the ones which they can always rely on to get the crowd back on their side and to set the dance back on fire. 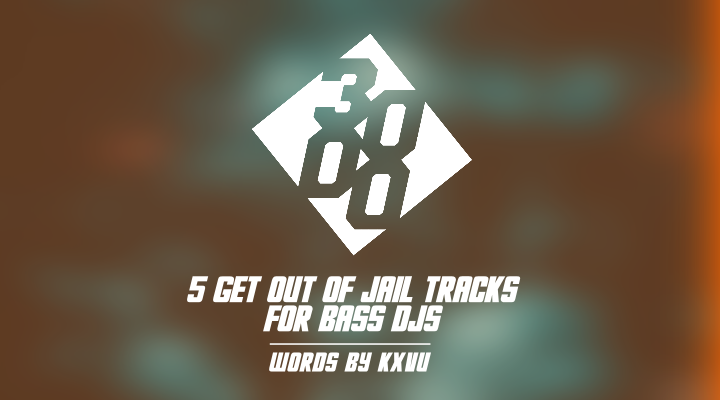 So, we have decided to list out top 5 ‘Get Out Of Jail’ cards for Bass DJs here. Now, these aren’t just tracks that everyone will know like the back of their hand, we feel this list is made up primarily by tracks that span over the genre boundaries, making them the perfect tool for spinning your set back into life at any moment. So here we go, our top 5 ‘Get Out Of Jail’ tracks for your viewing and listening pleasure. In reality, I don’t think there could ever be a more perfect track for a list like this. As far as Redlight’s production goes, there really are few who are able to hold themselves up to his level of unique creativity, being a producer that always sounds original, yet has tracks that appeal to both the general public and the niche surveyors. For us, this remains the ultimate DJ weapon, with the double drop opportunities of a life time waiting after every 8 bar, a tonne of cut-ready percussive stabs and a short 16 bar intro making it the perfect quick draw if you need an instant heater. This is another track that we simply couldn’t leave out of this legendary listing, with it’s longevity and legacy being made more apparent every year. The original version of Mr Virgo’s ‘Hypnotik’ was the secret weapon of both bassline & grime DJ’s up and down the country when it was first released, but with the resurgence of bassline in recent years, the track has yet again found itself at the genre’s forefront. Having seen numerous official remixes, including an absolute corker from the likes of Skepsis, this track is one that we can see being valid in any bassline dance for quite some time to come. This track also received a fantastic overhaul recently, as Egoless swept through with a flavorsome ska rework, making choosing between the two a really difficult task. Both would be very worthy of a place in this list. Now, as the only half-time 140BPM track to make this listing, some of you may be surprised to see ‘Skeng’ included. However, from a DJ’s perspective, I can safely say that there are few vocals I have ever found that work so so well across so many different genres, Killa P and Flowdan really do tear this one to shreds. Despite it’s unorthadox introduction, this is most certainly a track that has got me out of jail a fair few times. So, last but by no means least we see an appearance from DJ Zinc, who as a producer seems to always stay very current with the music he both releases and produces, coming up with belter after belter over the years. This track heads back to his ‘Crack House’ phase, filled to the brim with bouncy synths and tight rhythmic grooves, laying the perfect foundation for Ms Dynamite to do what she does best. This is a track that I’ve seen making it’s way back into sets recently, and why wouldn’t it, it’s pretty damn timeless if you ask us!